This month, the jQuery Foundation is celebrating our first year serving the web. As a not-for-profit trade association, we’re here to connect every business and individual that cares about jQuery and help them work together to ensure its continued success. Writing code and documentation, hosting trainings and conferences, and collaborating in the standards process. This makes jQuery better and it makes web development better. You can now join the jQuery Foundation as an individual member. Just as with companies, we have created various levels based on contributions. The benefits include buttons, stickers, badges, banners, discounted conference tickets, discounts from member companies, invites to members-only parties at conferences, and recognition on our member listing. We’ve prepared a thank you gift for each level to provide an extra incentive for folks to make an annual dues commitment. We’ve prepared badges and banners for our members to sport on their website, or their choice of social network. Huge thanks to Isaac Durazo (@isaacdm) from Bocoup for drawing these up. What if I Can’t Contribute On A Recurring Basis? The jQuery team, together with the support of member companies have achieved tremendous success in Year One. We have tripled the number of conferences, gathering with communities around the globe (Asia, Europe, Canada, and UK). We have redesigned (nearly) all our web sites and made contributing to them as easy as contributing to code. We continue to wrangle bug queues and deliver smaller, faster, better tested, and more robust code. We have 4 official representatives at the W3C and ECMA TC39. We’ve managed to do this all in our first year, and we’re very much looking forward to what we can accomplish in the future. Join us! I would rather show no badge than a “only one star” badge. So the $100 is by no means an option for me… I’ll check if the company I work at, would like to join. Btw, the goodies, do they come “complementary” or are they paid for separately? 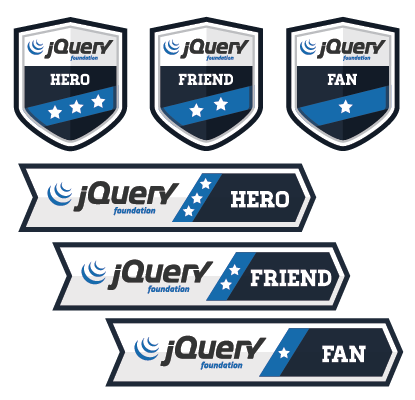 @jQuery Rocks: We’re thinking of doing some bonus gifts for one-time donations in the $25-50 range. But this would be unrelated to membership. Stay tuned. @Richard D. Worth: its would be great to buy some bonus gifts for lower donations to our workers. @Richard D. Worth: sounds great. I look forward to donating at some point, since I use jQuery almost every day. Wow i LOVE the badges, the design is relly great ! are these embeddable in HTML?